“Art takes nature as its model” – no less illustrious a personage than the Greek philosopher Aristotle said that. If you Google “art and nature quotes” (okay, I did!) you will find countless more – by Van Gogh, Chagall and others. As the primal creator, nature is arguably the most influential artist of all time. From the beginning of human history, nature has played a vital role in our creative expression, inspiring not just visual artists, but also composers, songwriters, poets, authors and dancers. You can’t walk into an art museum anywhere in the world and not find yourself surrounded by paintings of picturesque landscapes, bucolic country scenes, dark forests, towering mountains and vast oceans. Here in Southeast Asia, we lucked out when nature was distributing its bounty and seem to have gotten more than our fair share. We have tropical rainforests that are remarkable in the biodiversity of their flora and fauna. The waters surrounding the island archipelagos of Southeast Asia draw deep sea divers from around the world, attracted to the rich variety of its marine life and coral reefs. Southeast Asia’s artistic greats, like Indonesia’s Raden Saleh, the Philippines’ Fernando Amorsolo and Singapore’s Chen Chong Swee, whose works are pictured above, definitely took notice and inspiration from the natural beauty that was at their doorstep. Yet, in the last couple of decades or so, the region has become one of the most rapidly urbanizing in the world, with some Southeast Asian cities already among its most populated metropolises, teeming with millions of inhabitants. Urbanization is, of course, a double edged sword – and a subject too complicated and multi-dimensional to tackle here. We all love, on the one hand, the booming economic growth, higher standard of living, soaring skyscrapers and modern amenities that come with urbanization – but how do we balance that against what we give up in exchange, when they “pave paradise and put up a parking lot”, as the inimitable Joni Mitchell sang in “Big Yellow Taxi”? This is a question that several artists from Singapore and Malaysia have explored, with sensitivity and depth, and in diverse and interesting ways, in two exhibitions that we recently visited. While U and I were in Yogyakarta a few weeks ago, we visited Gajah Gallery‘s Yogya outpost, the Yogya Art Lab (YAL), on the last day of its exhibition, SuperNatural – an excellent show in which we were proud to see some great works by several Singaporean contemporary artists. Here are a couple of favourites, among the many that we loved, that explore the tension between our desire for progress and development and the impact on our natural environment. Zen Teh‘s artistic practice, which encompasses photography and painting, often explores man’s relationship with the natural world. This work, Singapore Landscape Painting, takes the form of a Song dynasty scroll painting – a particularly apt choice of form since there is almost no other cultural tradition in which nature has played a more important role than in that of China. Teh’s photographic “painting” follows the genre of Chinese landscape painting in incorporating the elements of mountain and water, or shan shui. 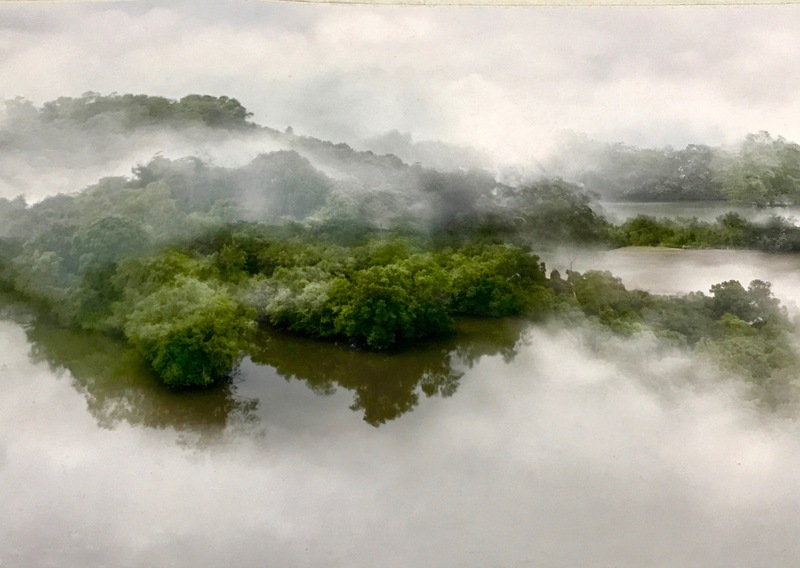 The images are composite photographs of Singapore’s nature reserves. Teh, however, adds another layer of meaning to the work by tracing the musical score for Singapore’s national anthem Majulah Singapura (which means, Progress Singapore, in Malay) and composing the landscape so as to parallel the peaks and troughs of the musical notation of the score. Teh, whose practice encompasses research into environmental loss, nature and human behaviour, references the national anthem’s rallying cry to seek progress and questions the cost of such progress in terms of the loss of its natural environment. Artist Jason Lim‘s series of resin sculptures take the form of entwining banyan tree vines, branches and human bones – visually arresting works that are impossible to ignore. The banyan tree is an important symbol in Indian mythology, bearing sacred meanings in both Hindu and Buddhist classical texts. The allusion to the divine in nature, juxtaposed against human bones, creates a jarring, almost grotesque, contrast – one that suggests that man’s incursion on the environment is, likewise, an unnatural and even violent act. Clearly, the question of how best to negotiate the delicate balance between preserving paradise and gunning for progress and economic growth bothers artists from other countries in the region as well. Back home in Singapore, Malaysian (Sabah-born) artist Chris Chong Chan Fui‘s gorgeous mechanical plant and flower sculptures and detailed botanical illustrations are on display, till 23 July, at Chan + Hori Contemporary. In Endemic, pictured above, the amazingly life-like “specimens” of rare plants endemic to the island of Borneo are, in fact, artificial copies manufactured in a factory in Thailand. The works in Botanic, on the other hand, call to mind botanical illustrations from a natural history reference text but are, in fact, drawings of common, mass-produced plastic flowers. So, here you have: (1) plastic replicas of real, though possibly extinct, native Bornean plants; and (2) detailed illustrations of what are, in fact, plastic artificial flowers. The mind boggles with all the complicated issues that Chong has artfully combined into one beautifully-packaged presentation of gorgeous plants and drawings!